As promised, I shall continue to 'show off' my vintage collection... and this time, it is traditional Chinese paper cuts that I collected when I was young. As a child, I loved to draw, cut, fold ( origami) and build ( lego). Of course my cutting technique was hardly refined, but I loved folding colourful square paper into smaller squares and then cutting triangles, squares, circles and other patterns on it... The most thrilling moment was when I finally unfolded the paper to see my new symmetrical creations! Would kids these days be thrilled by this? I am not so sure. Paper cutting is a traditional folk art/ craft that originated in China, and eventually spread to other parts of Asia and the rest of the world. Its history could trace back to the invention of paper introduced by Cai Lun ( 50-121 AD). And in 2009, it was recognised and listed by UNESCO as an Intangible Cultural Heritage of Humanity. Paper cuts are traditionally used for religious and ceremonial purposes ( such as funerals and weddings), and as decorations during festivals such as Chinese New Year. Red paper is often used with Chinese characters that represent good luck, joy, health and hope. Traditionally, the patterns are either first drawn or carved by free hand, and then engraved by knives. The styles and characteristics of the patterns/ designs vary a lot in different regions whilst sharing similar/ common themes. Most of the time, the designs are symmetrical but the ones pictured here are all asymmetrical. The first two sets seen here are from the southeastern city of Yangchow ( now renamed as Yangzhou), which is said to be one of the earliest regions to adopt paper cutting as folk art. A folk arts and crafts agency was set up in 1955 to revive the neglected art and skills, and in 2007, a Chinese paper cut museum also opened in the city, showing the importance of paper cut in the region. 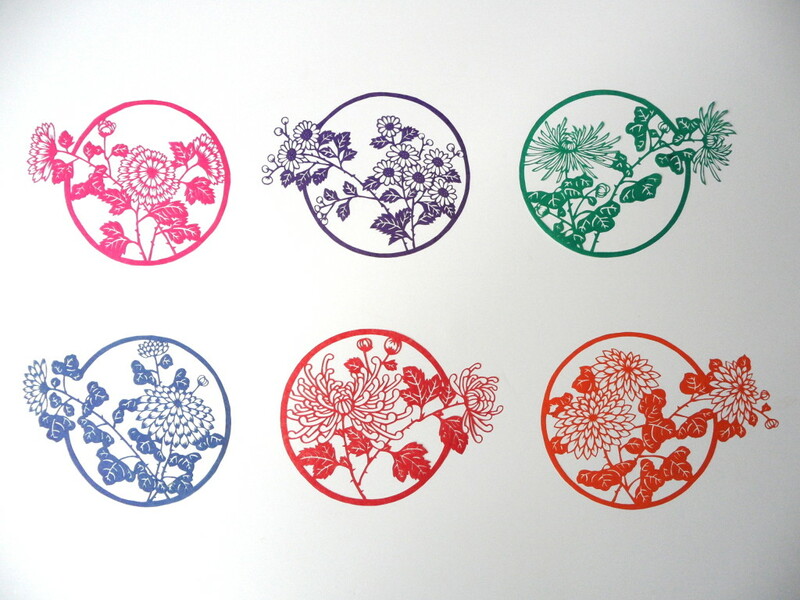 The third set consists of 6 designs of chrysanthemum and it is from Nantung/ Natong. I had to be extra careful when I tried to photograph these designs made of thin rice paper because they are so delicate. I could see that they were all hand-cut with great skills and patience, a shake in the hand would ruin everything. The last set, which has a very different style from the others is from the Northeastern county of Yuhsien ( now renamed as Yuxian) in the Hebei province. 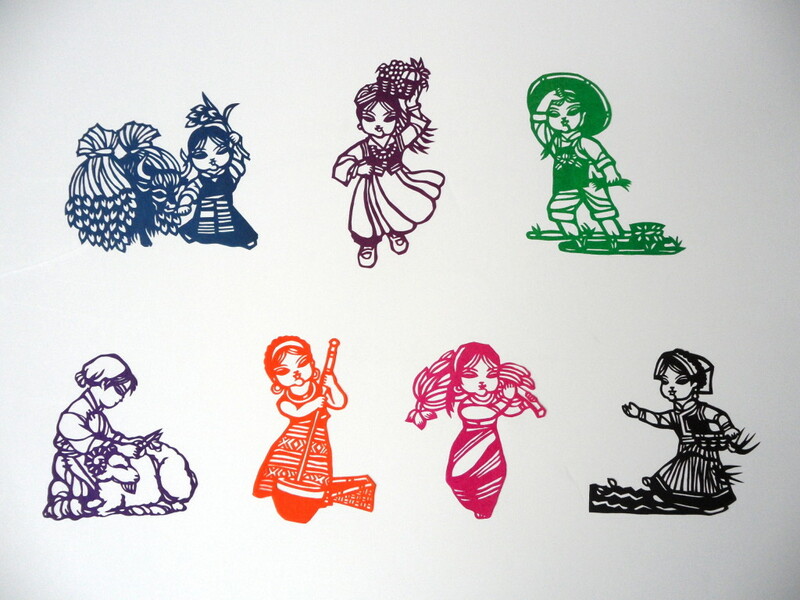 Dating back to the Ming Dynasty, paper-cutting of Yuxian is especially well-known for its colourful and vivid asymmetrical designs of Chinese opera characters, insects, animals and rural life. 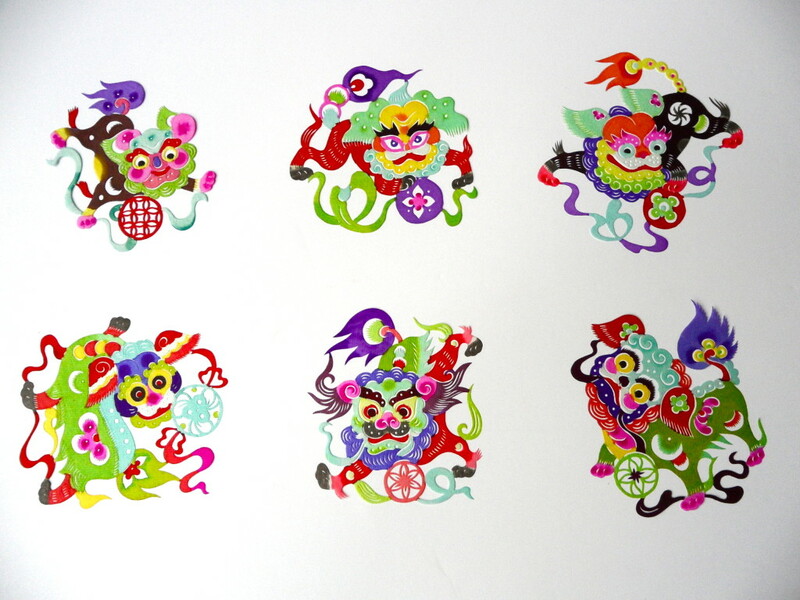 The designs shown here are inspired by the mythical Chinese creature, qilin. Since 2010, the county has been hosting an annual paper cutting art festival and opened its first paper cut museum in 2011, exhibiting over 1200 pieces of art work from across the country. The county is now home to more than 30,000 paper cutting artists and craftsmen, and their work are being sold worldwide generating more than 3% of the country's GDP! If you are interested in learning more about traditional Chinese paper cutting, there is more information via the following links: The art of Chinese paper cutting and Chinese Traditional arts and crafts. Hi: my husband passed away in February. He lived in Hong Kong in the early 70's. Where he collected vintage paper cuts. I am looking to sell them I have to many to put on eBay. I really hope you can help me . I am looking for someone who would be interested in buying them all. Please can you help me. I can send you picture's of some of them so you can see. But as I say I have a lot. Thank you so much. If you want to see then please send me your email address. 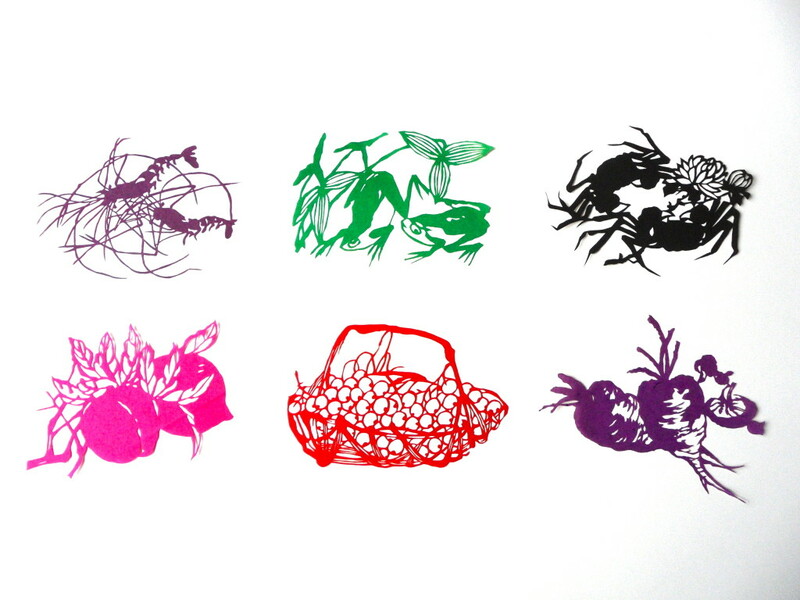 Can't wait to see the yuhsien paper-cuts! greetings in writing on them? Hi Isabel, you can either frame them or stick them onto your notebooks/on windows. They are mainly used for decorative purposes, but you can also give them to friends and relatives as gifts too. I hope this helps! Hi, Sally. Sorry but I don't know enough on the topic to help you. Though, geishas are Japanese, so I doubt they are geishas.